Big thank you to CWH for arranging such English-Speaking Tours. My family and I had such an amazing time in Japan! BEST TRIP EVER! 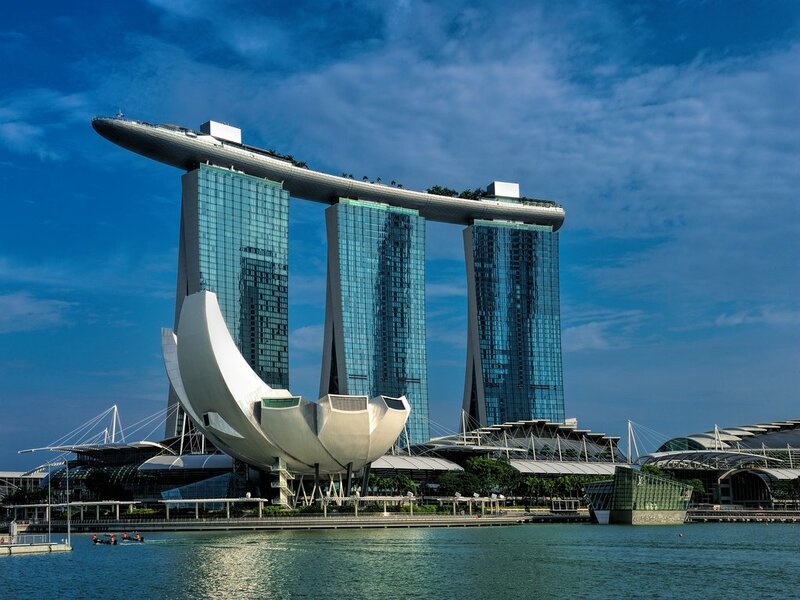 Japanese "Hot Spring Foot Bath"
Depart from Singapore Changi Airport for your flight to Nagoya. Upon arrival, proceed for your tour of Nagoya, the city of Samurai. Be amazed in the SC Maglev and Railway Park, focusing mainly on the Japanese shinkansen known as Bullet Train; with actual train models exhibits ranging conventional trains through to the next-generation. Enjoy a leisurely stroll in Shirotori Garden, a traditional Japanese garden and tea house. Continue to Noritake Garden, to see world’s famous Japanese western table wares. Walk through the beautiful garden with the red brick buildings from the Meiji era and monuments of old chimneys. Look out for the Nagoya TV Tower a prominent structure in the city center. 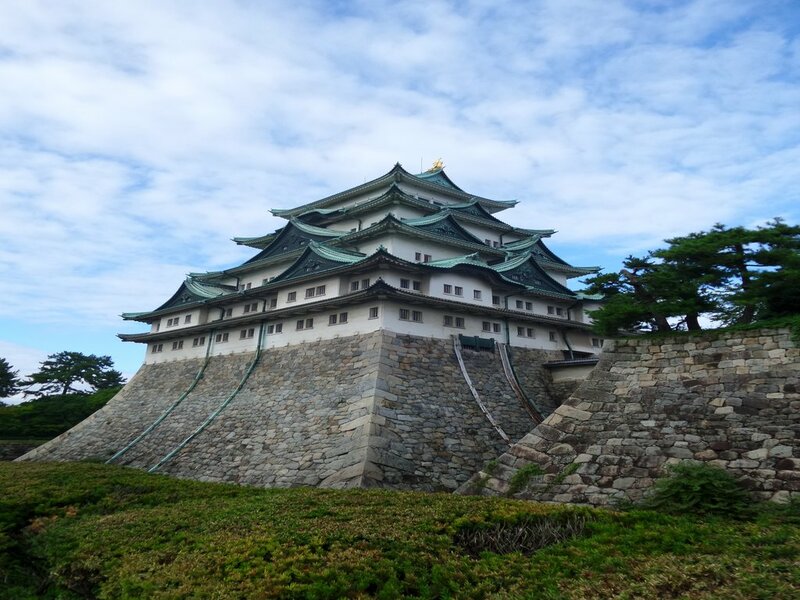 Next stop by Nagoya Castle (admission not included); one of the better classic Japanese castles still intact and well preserved. Ends the day at Osu Shopping Arcade, a covered shopping street lined with shops and restaurants, sometimes compared to Tokyo&apos;s Akihabara district as there are a lot of stores that specialize in electronics, cosplay, anime, J-pop and idol goods. After breakfast, visit Nabana no Sato Flower Park. Enjoy a stroll through the grounds bursting with seasonal flowers and shrubbery. No matter the season, it has something to see. Whether it is the fields of tulips in the spring, an ocean of hydrangeas and irises in early summer, or a carpet of cosmoses and dahlias in the fall, there are always new blooms of color awaiting you. Comes November to March, instead of flowers, the park comes alive at night with winter night lights. In the afternoon, continue to travel to Hamamatsu - the midway from Osaka to Tokyo. Visit the Hamamatsu Flower Park where seasonal flowers and greenery throughout the year. Continue to visit the Eel Pie factory see the famous "eel pies," a popular type of butter cookie that contains extract of eel are made. 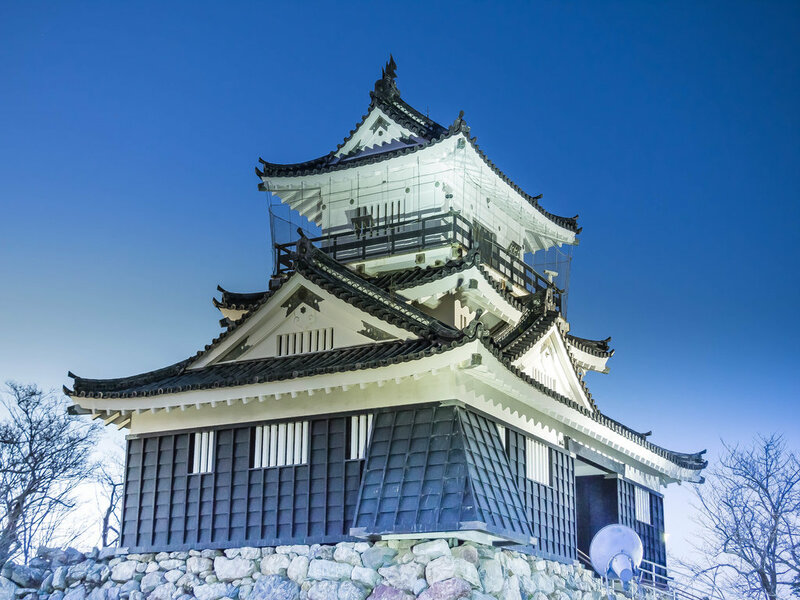 Move on to visit the Hamamatsu Castle, the only castle located in the center of the city; surrounded by rich greenery and about 500 cherry trees, a popular place to view the cherry blossoms during spring. This morning, experience the shinkasen ride to Kakegawa. 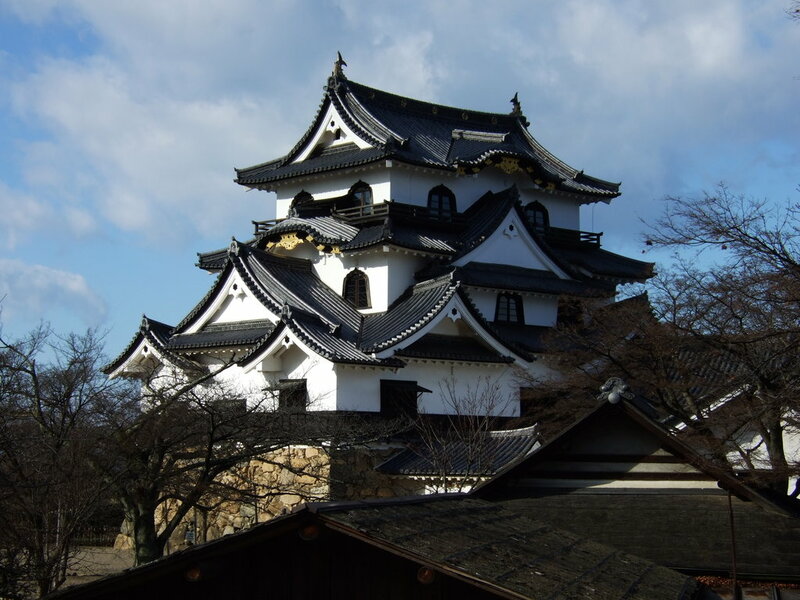 Visit the Kakegawa Castle, one of the best castles in the region surrounded by many historical buildings left from the olden days. Proceed take a ropeway up to the Nihondaira Plateau a natural park to enjoy a panoramic view of Mt. Fuji and Suruga Bay. Visit the Kunozan Toshogu Shrines located at the top of Mt. 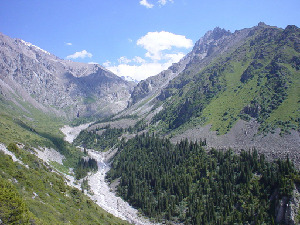 Kuno which consists of a large number of bright red buildings decorated with gold accents and colorful carvings and paintings designated as important national assets. Outside the shrine stands the Museum of Kunozan Toshogu which exhibits collections of the successive shogun’s personal belongings and shrine treasures, such as swords, armors, clothing and hanging scrolls and a Dutch clock offered as a diplomatic present. Continue visit to Tokaido Hiroshige Art Museum the only museum in Japan devoted solely to the works of Hiroshige, the ukiyoe artist whose most famous series of woodblock prints which were beautifully preserved and brightly coloured; showing mostly landscapes and procession scenes, with rich blue for the sea, bright pink for the frequent cherry-blossoms, a lively green for the dragon&apos;s head on the prow of a ship. 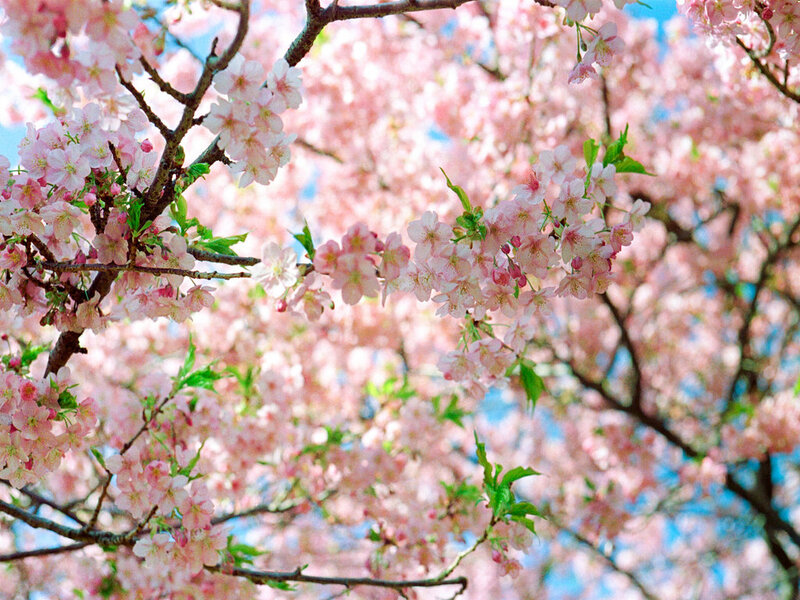 The area is also best known as the sakura-ebi capital of Japan. These tiny pink "cherry-blossom" shrimp make a very tasty tempura dish. Here drives pass the Sattatouge a narrow highway along the cliff overlooking the majestic Fuji ahead. Wake up slightly earlier this morning to visit the Numazu Fish Market, a fishery port where many wholesalers and restaurateurs come to get their daily fresh loads of fishes and seafood. Witness how they bet for the catch and witness how the tuna are cut up. You may also taste sushi and seafood at the restaurants inside the fish market at own expenses. Next, travel inwards to the Izu Peninsular. Visit the Kawazu Bagattle Park a sister garden to the Bagatelle Park in Paris, France renowned for its French style rose garden as well as shops that sell perfumes and gardening goods, enjoy the atmosphere of 18th century France. Next experience the Japanese "Hot Spring Foot Bath" by soaking your feet in the hot spring bath to relax the tiring feet and feel the warmth throughout your whole body. In ancient Japan the "Footbath" was enjoyed as a way to socialize and enjoy conversation. Great for those who are too shy to completely remove their clothes and take the hot spa fully naked in the onsen. Kawazu is also a famous place for early-blooming “Kawazu-zakura” (cherry blossoms). The best viewing time usually last for about two weeks around late February and early March, although this can vary quite a bit from year to year depending on the temperatures. 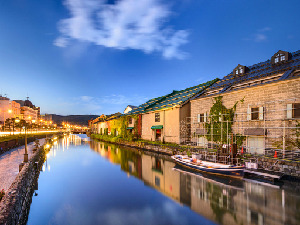 Travel to Shuzenji this morning and enjoy a stroll around Shuzenji-onsen. This nice onsen resort town also comes with a small bamboo forest among historic hot spring baths. Next, hope on the ropeway to visit Izuno Panorama Park to enjoy overlooking the rooftops of Izu-no-kuni. From the summit observatory see a 360-degree panorama that includes Suruga Bay and Mt. Fuji. During springtime see plums, cherries, azaleas. During summer, hydrangeas and lilies, in autumn the autumn leaves, cosmos, and amaryllis, and in winter camellias. 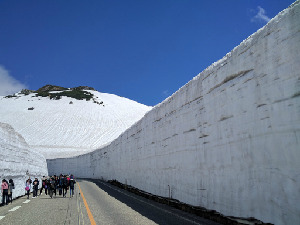 (Note: Subject to weather conditions) After lunch, transfer to Fuji Area. Visit Oshino Hakkai a small village in the Fuji Five Lake region with eight small ponds filled with clear underground spring water from Mt Fuji; filtered by rocks of lava and contain large amount of minerals. From there, move to the Fuji Visitor Center located at the base of Mt. 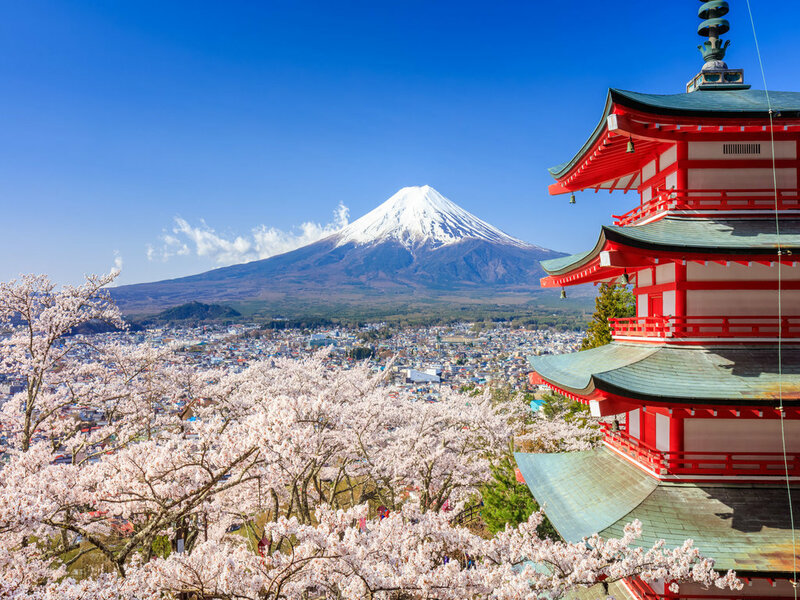 Fuji and has a small museum which exhibits the formation and ecology of Mount Fuji, as well as cultural history of the mountains, and also an observation deck with views of Mount Fuji. After breakfast, proceed to travel to Tokyo. Visit Ueno Park, a spacious public park located in the Ueno section of Taito, Tokyo&apos;s most popular spot for outdoor hanami parties during the cherry blossom season. 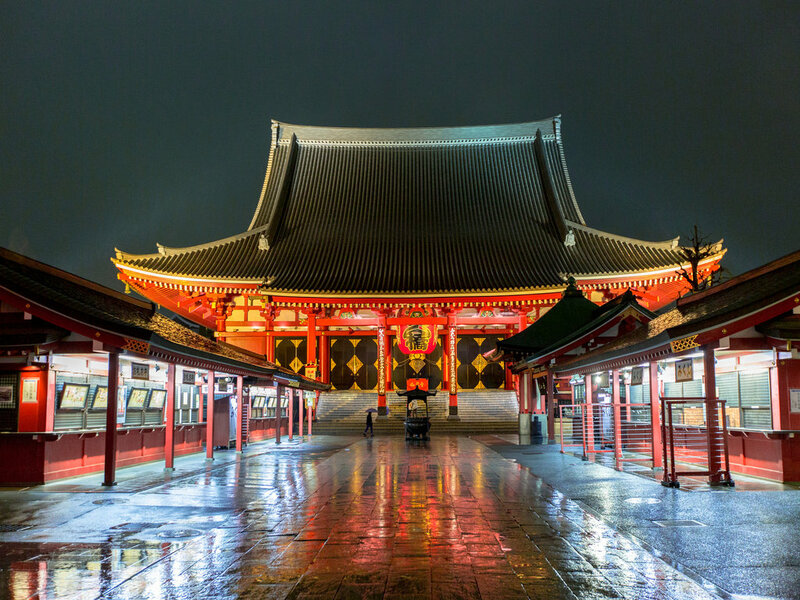 Next, head on to visit Sensoji Temple also known as Asakusa Kannon Temple a Buddhist temple located in Asakusa and one of Tokyo&apos;s most colorful, most popular and oldest temples. 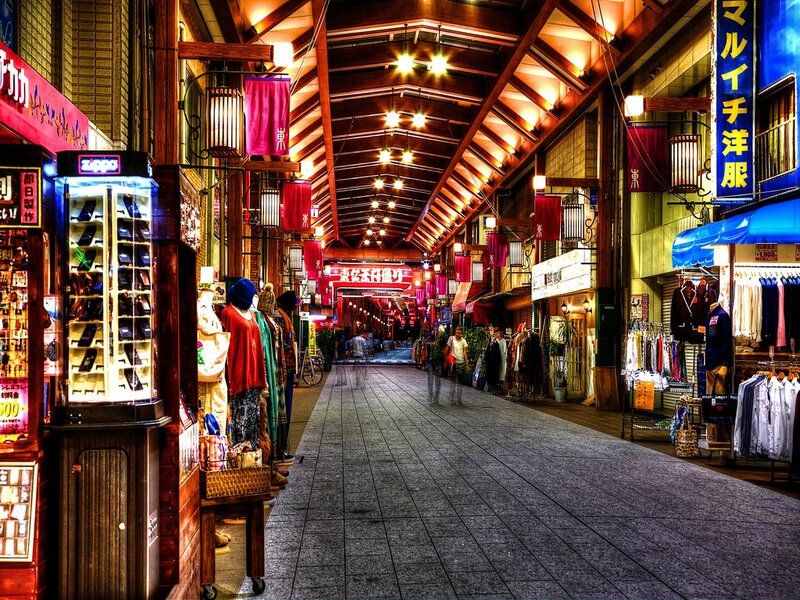 Just outside the temple find the Nakamise Street, a popular shopping street with a history of several centuries of over 200 meters, filled with typical Japanese souvenirs such as yukata and folding fans, traditional local snacks etc. Next, hop on a boat ride on the Sumida River. Traversed by twelve bridges whose design and color delight the eye with famous and historic sites on the river banks and see how the old Edo Tokyo still exists hidden inside the modern city. Stop by at the Imperial Palace Gardens. The palace is located on the former site of Edo Castle, a large park area surrounded by moats and massive stone walls in the center of Tokyo. Stop at Ginza Tokyo&apos;s most famous upmarket shopping, dining and entertainment district, featuring numerous department stores, boutiques, art galleries, restaurants, night clubs and cafes. End the day visiting Roppongi, Tokyo’s most popular nightlife district filled with bars, restaurants and night clubs. 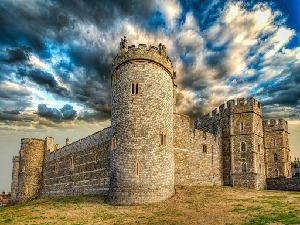 *Note: Subject to approval by the Imperial office as the Imperial family is still residing in the palace, only can be made known a week before visiting. After breakfast, free at leisure until time for transfer to airport for your flight back to Singapore.